Automotive filter remove the solid matters such as dust, mould and pollen from the fuel and gas. Automotive filters help the engine to run smoothly and ensure that there is adequate air flow to the engine which further lessens the fuel consumption and carbon emission. High research & development and collaboration between companies have been seen as an emerging trend across the global automotive filter market. The market of automotive filter is anticipated to grow at a CAGR of 8.8% over the forecast period 2017-2024. Further, global automotive filter market is expected to reach USD 10.1 Billion by 2024 from USD 5.6 Billion in 2016. This can be attributed to various factors such as increasing number of automobiles on road, burgeoning middle class population and rising concerns about environment. On the basis of type, the automotive filter market is segmented into air filter, fuel filter and oil filter. Air filter accounts for the highest percentage of market share accounting for more than 75%. Stringent government regulations to curb carbon emission and greenhouse gases are major factor driving the growth of the air filter segment. Further, air filters reduce the fuel consumption by providing proper air flow to the engine. 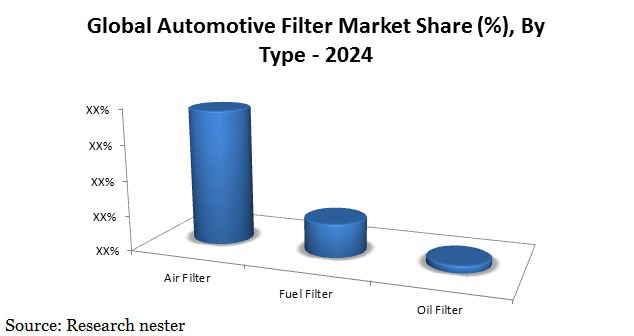 Increasing demand and sale of automotive is anticipated to be the key factor behind the growth of automotive filter market. Further, rising disposable income impelled the purchasing power to demand for more cars. On the other hand, elevated replacement rate of automotive filter due to tear and wear is further expected to boost the growth of automotive filter market. Strict government regulation to curb the carbon emission is expected to spur the growth of global automotive filter market. Government of developed countries such as UK, U.S., Germany and others has enforced strict laws to reduce the pollution caused by vehicle. For instance, in U.S., the environment protection agency has implemented the mandatory average fuel economy of 42mpg for cars and 26mpg for trucks. Similar regulations have been implemented by other developed countries across the globe. This factor is likely to boost the market of automotive filter. In contrast, increasing demand and sale of electric vehicle is the major factor restraining the growth of global automotive filter market. Luman Automotive Systems Pvt. Ltd.